Published: . Filed Under: Raising Kids, Uncategorized. Did you know that 1 in 20 teenagers report using DXM to get high? And 1 in 3 say that they know someone who has abused it. Dextromethorphan (DXM) is a safe and effective ingredient found in many over-the-counter (OTC) cough medicines. More than 100 medicines containing DXM are on the market. They come in the form of liquids, capsules, gel caps, lozenges, and tablets. Yet when abused, DXM can cause side effects including mild distortions of color and sound, hallucinations, and loss of motor control. Other dangerous side effects can include abdominal pain, nausea and vomiting, rapid heart beat, and drowsiness. 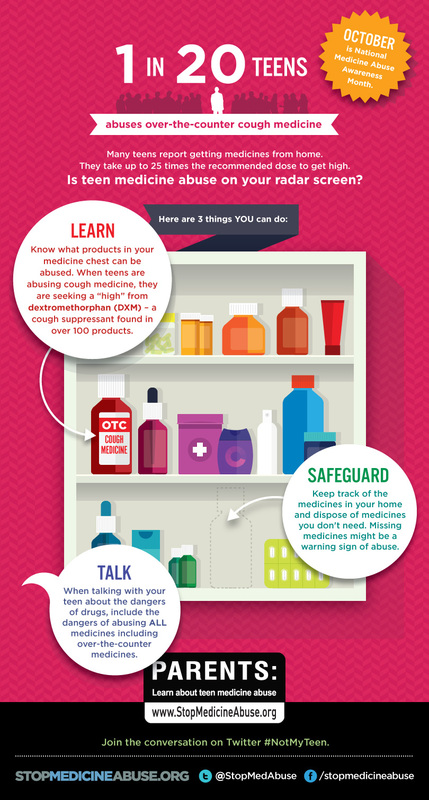 Parents need to know that kids are opening their medicine cabinets and abusing common medications to get high. The first step in preventing this abuse is to educate yourself and your family. For more information, conversation starters and useful resources for parents and community members, go to www.stopmedicineabuse.org. Parents can also follow @StopMedAbuse on Twitter and use the hashtag #NotMyTeen. What can adults — parents, teachers, family members — do once they learn the facts? Look for the StopMedicineAbuse.org icon on the bottles or boxes to identify medicines containing DXM. Look out for warning signs such empty bottles or packages in your child’s backpack or trash, as well as loss of interest in favorite activities, changes in friends or daily habits, and dropping grades. Talk with your child about the dangers of over-the-counter drug abuse. The data shows that what parents say does matter. In fact, teens who learn about the risk of drugs from their parents are 50% less likely to use drugs. October is National Medicine Abuse Awareness Month. Stop Medicine Abuse is a prevention campaign funded by the Consumer Healthcare Products Association. The goal of the campaign is to alert parents and community members of the dangers of teens abusing OTC cough medicines. The team at Stop the Medicine Abuse is hosting a Twitter party tomorrow, October 1st from 9 to 10 p.m. EST. The conversation will be about raising kids with character. Use the hashtags #NotMyTeen. Get informed, talk to your children, and join the conversation. Let’s stop the abuse of DXM and over-the-counter medications. Had you heard before of this growing danger? One of the nice post.. Antibiotics drug should not be sold over-the-counter , these drugs tend to kill the protein synthesis in the human body. it is says by the Professor Venkatraman..
Hello there, I discovered your website by means of Google when evaluating a similar subject, your site emerged, seems like wonderful. We have put into this favourites features|added onto social bookmarks.